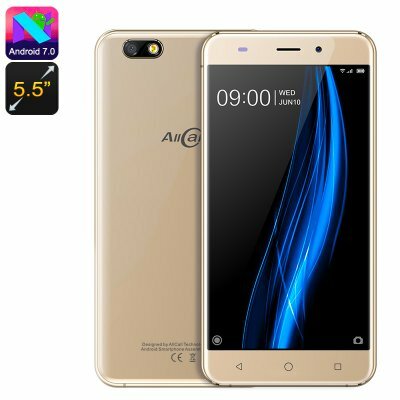 Successfully Added AllCall Madrid 3G Smartphone - Android 7.0, Quad Core CPU, Dual SIM, 5.5 Inch Display, 2600mAh Battery (Gold) to your Shopping Cart. Running Android 7.0 OS out of the box you'll enjoy the intuitive interface. Efficient Quad Core CPU from MediaTek balances performance and power usage. 2600mAh battery is enough for a day's worth of talk time. 5.5 inch IPs display brings HD resolutions for movie and game enjoyment. This attractively priced phone from AllCall is known as the Madrid. It comes packed with all you need from a phone for a reliable performance but won't break the bank. A quad-core MediaTek processor and 1GB of RAM combined with an Android 7.0 OS deliver a reliable service so you can make calls, surf the web, catch up on social media and all at a ridiculously low price. The 5.5-inch display brings HD resolutions so you get a nice vie3wing experience for games and movies. With a 2600mAh battery, you'll have a long performance life from a single charge that should easily see you through the day. Quad-band 2G networks are supported as well as 3G band 1 and band 8. This brings data services to a wide range of countries so you can stay connected on the go. The Madrid phones exterior is nicely finished with metal frame and sleek styling's that are easy on the eye, If you're looking for a reliable phone that is highly affordable then this Android phone hits the mark. The AllCall Madrid cell phone comes with 12 months warranty, brought to you by the leader in electronic devices as well as wholesale Android phones from China..